Known in its native South America as chisaya mama (mother grain), quinoa is actually a seed and is a complete protein. The apple is high in soluble fibre to help keep our digestive system healthy, and the pecans are high in cell-protective antioxidant vitamin E.
1. Place the quinoa, water, cinnamon, nutmeg and cloves in a small saucepan and bring to the boil. Decrease the heat to low and gently simmer for 10 minutes, or until almost all of the water has been absorbed and holes appear on the surface. 2. Cover and remove from the heat to finish cooking for a further 5 minutes, or until tails have sprouted and all of the water has been absorbed. 3. Transfer into a medium bowl and set aside to cool slightly. Alternatively you can use 1½ cups (200 g/7 oz) of cooked quinoa. 4. Add the apple, yogurt, orange juice, pecans, dates and honey and stir to combine. Transfer into an airtight container and refrigerate overnight. 5. 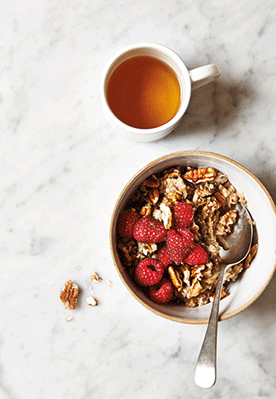 To serve, top with additional yogurt and raspberries, plus pecans and an extra drizzle of honey, if desired. NOTE: This can be stored in the refrigerator in an airtight container for up to three days.